“Is it not easy to be a wise man on top of a mountain”. My room was basic, quiet and achingly cold. Begrudgingly, I shuffled my body away from the warm multi-layered blankets and sleeping bag, turning my head toward the window to gaze out into the night. The prior afternoon, I was climbing the steep mountain ascent that begins above the Himalayan village, Namche Bazaar, when a series of clouds swiftly vanquished a previously gorgeous blue sky, enveloping the lower peaks and cloaking me in a sea of ethereal chilled clouds. The stunted alpine trees and grassy hillsides I was walkking through abruptly took on a mysterious tone. Soon descending, distant human and animal sounds reached my ears, telling me my destination was near, the Sherpa village of Khumjung. By nightfall, the fog had gradually lifted over the mountain village, however, the Himalayas, including Mount Everest, still remained a mystery. For the second night, I was the only guest at a Sherpa family operated lodge that I had chosen for my stay. The warm fireplace stove situated in the center of the dining room was a great welcome and relief, especially since heating sources are a scarce commodity. The food was tasty and filling. The family’s husband loaned me a book on Sir Edmund Hillary, the book dedicated to the 50th anniversary of his Everest summit. I asked if he and his wife had ever met Hillary and he said, “Yes, many times, including the big party thrown in Kathmandu three years ago celebrating the 50th anniversary.” I said “very cool” and we shared a cup of tea. Since the summit, Sir Edmund Hillary had continued to contribute a great portion of his life to the betterment of the Sherpa people, a people he had become so fond of and admired. Bedtime is always early in this cold region. I scrambled under my blankets and prayed for clear skies in the morning. My prayers were answered. I was awestruck when I looked out my bedroom window. A moonlit night, an abundant horizon of Himalayan giants, including the “Big Guy”, Mount Everest, glowed in the near distance, while crystal clear, sparkling stars danced over their heads. The uniquely shaped Ama Dablam was regally crowned with the Southern Cross constellation. The time was 2AM. I could not wait for daylight. Morning light marked a truly memorable moment. I was staring at the “top of the world”, Mount Everest and friends: Nuptse, Lhotse, Ama Dablam, and other snow-frosted, steel gray masters of the Himalayan range. The grandeur of the landscape was breathtaking, humbling. I shared many respectful salutations with the peaks, ranging in languages from Nepalese to Navajo. I joyfully shouted the Basque cheer and even did an Irish jig. It was, you may guess, an exciting moment. Worlds apart from where I stood, these peaks held their court, lived on their own terms far from humanities’ influences. This was the realm of the snow leopard and the Yeti, a fiercely frozen, inhospitable, glorious region. So how did I get to this place? The Himalayan Everest trek began with a Yeti Airlines flight from Kathmandu to Lukla. The small aircraft rises over the Kathmandu Valley and within minutes is within view of the approaching Himalayan mountains. The journey climaxes with a swift descent to a narrow mountain valley where Lukla’s small inclined runway assists arrivals. I grab my backpack, say “no guides, no porters” to many an anxious Nepalese, lift the bag onto my shoulders and proceed briskly forward through Lukla to the beginning demarcation of the trail. Even from Lukla, there are dramatic views of several peaks, their shimmering sections of bleached-white snow set against the steelly gray granite rock peeking above the green canyon valley I now traversed. The initial five miles of trail is fairly level, sloping first down to the river, past several villages, and gradually ascending parallel to the river. Along the trail, many Swiss-built, reinforced steel cable bridges crisscross the river. They don’t sway TOO much, depending on how many yaks and porters are also on the bridge. Let your eyes drift downward and you realize how small the river now looks! This particular trail is heavily traveled by trekkers, porters and beasts of burden alike. Initially I maneuver pass the large group processions, each accompanied by their guides and porters. These processions, however, pale in size to the leagues of sherpas and their labored yaks, that regularly traverse this trail’s steep stone steps to deliver supplies to the trail’s linked villages, some many miles away. You skirt along a narrow section of the trail and bang! you have to find a safe spot to position yourself as a long yak team comes lumbering in your direction. The scenery along the trail is simply beautiful: crystal clear blue river, occasional waterfalls, interesting villages draped in prayer flags, and the occasional appearance from one of the locals. To my surprise few people, trekkers and locals alike, bothered to take a moment to find a spot to rest their gear and marvel at their surroundings. I did as often as I could. The scenery directly on the trail usually consists of gray slippery stones, gravel, loose dirt, wet mud and plenty of yak dung! Several Buddhist stupas are positioned along the trail, offering comfort to those laboring sherpas. The sherpa, men and women, all ages, carry everything: full cases of beer and whiskey, propane tanks, beds, wooden beams, you name a product…it’s on their backs! I spent a very pleasant first night with a Sherpa family. Besides the spectacular moonlight enhanced views of the mountains, waterfall, river, and forested canyon that night, I also gained a friend…the family pet dog. He took a liking to me and sometime in the middle of the night, he had pushed my poorly latched door open so he could sleep on the bed next to mine. The second day included a steep 2000 foot climb to Namche Bazaar, the veritable metropolis (there’s a lodge with electricity) within the Sherpa Khumbu region. Always the day’s highlight was gazing upward at those massive snow and rock monoliths, the day’s altering light and moonlight providing different shades and moods to the Himalayas. 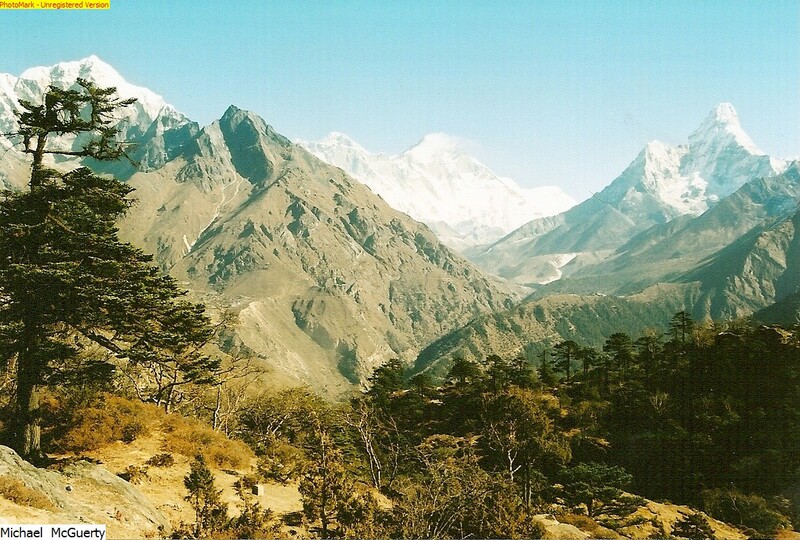 This was still an ancient landscape, watched over for centuries by the regions traditional mountain people, the Sherpa. Even here, the encroachment of the modern world provides amusing dichotomies as young Sherpa ogled their cell phones after they’d spent the afternoon grinding corn the same way they had for centuries. The old and the new worlds colliding again. Each year, more people attempt to summit Mount Everest. Each year, more large groups of ill-prepared, ill fit hikers attempt the trek to base camp. Each year, more red rescue helicopters fly out some of those ill-prepared hikers, at considerable personal expense. On my return, ninety marathon runners passed, upward bound to run a marathon, a route that passed Everest base camp, crossed an 18,000 ft. mountain pass that circled over to Gokyo and back down to Namche Bazaar. More power to them, I thought. Back in Kathmandu, I smiled when a young Swede told me he decided to see Mount Everest by plane. As his plane passed Mount Everest, he was going to raise his gin and tonic glass, look out the window and toast the poor fools down below struggling up the mountain. For me, the sweat and struggle of the trekking journey just makes the view of the “top of the world” that much sweeter and a heck of a natural high! 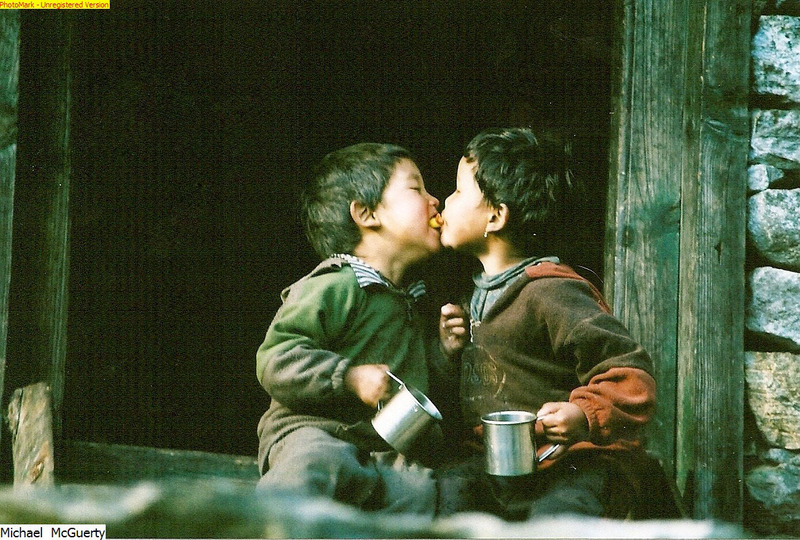 This entry was posted in Nepal Travel, Travel and tagged adventure, budget, everest, himalayas, kathmandu, mount, nepal, postcard, travel, traveler. Bookmark the permalink. Good point! Without the struggle it wouldn’t feel half as good. I’m sure your memories of the trek will be burned into your mind now! I salute people who have brave hearts to climb the mount everest, there’s no moutain too high for them. Hi this is nice place for tours and traveling. i also want to go in the mount everest trek Nepal. 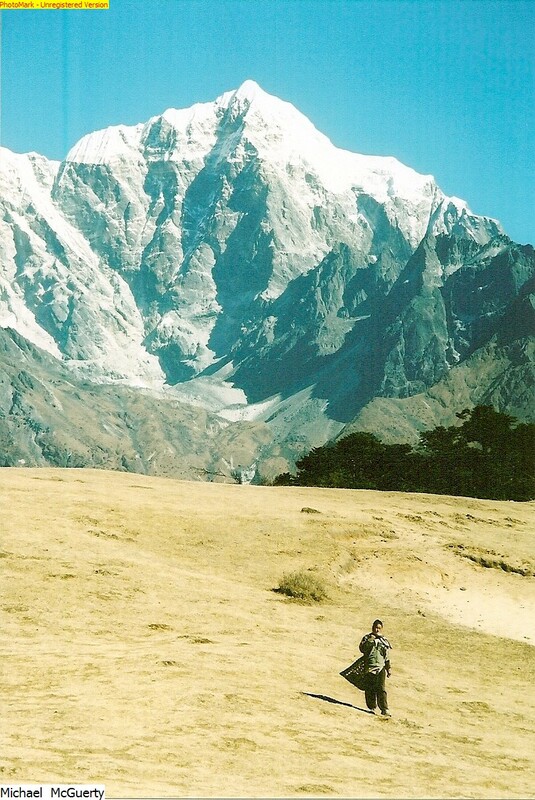 if you want more information about the Nepal trek so click on this link.